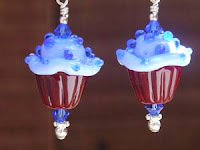 I have lots of cupcake beads to work with this week and they'll all be earrings. I just love these little guys...some are chocolate cake from Bindy Lambell and others are in spring colors by Lezlie Belanger. Either way, they make the sweetest earrings...and they aren't corny looking. Because of their small size, they turn out surprisingly elegant! Some have sprinkles, others just have fluffy frosting. I have a range of colors to go with just about any outfit in your closet. So....where's the sunshine? We've been spoiled here in parts of California with sunshine, but now that I need to take photos, it just isn't happening! 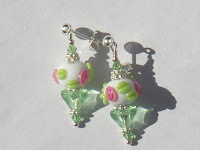 So, since I'm indoors, Spring Rosebud earrings are being created...you can see them here. The beads from Krissybeads are sooo sweet in pink and green against white. Kris's beads are just a little smaller than what I usually order so all of them are just that...sweet...just like Kris's heart, no doubt. 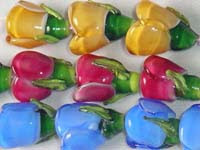 The Mickey Ears beads are on their way to my studio...what fun those will be to turn into earrings! They'll be perfect for Disney summer vacations. There will only be two sets, so keep YOUR ears open (hee hee) for my email announcement when those are ready. Until then, have fun shopping on RockerJewlz! If it's Tuesday, this must be Napa! Greetings from "my studio" in Napa. Actually, I'm visiting family that lives in Napa, but since I can haul my jewelry cases anywhere, where ever I am, there is my studio. It's like a mini resort here. 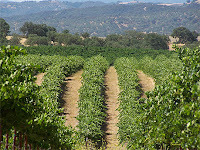 I'm in a house with floor to ceiling windows which sits on a small knoll that is almost completed surrounded by vineyards...but the vineyards belong to a neighbor. We get to enjoy them without being responsible for them! My first sale since launching my website was the sweet pink pair of "Cherry on Top" cupcake earrings. Yahoo! The next few days will be spent creating more "perfume bottle" earrings, jewelry for you to purchase for Mother's Day and a variety of earrings for sale at the Lightning Joe's Guitar Heaven gift shop in Arroyo Grande, CA. I sent out the RockerJewlz website announcement through three huge email lists...and ooops!...didn't put the addresses in the BCC field.....so sorry! It felt great to receive comments like, "stunning creations", "great flow in the site", "awesome site". At times working the website is more fun than making jewelry! Thanks everyone, and Kandice, you were the first to comment on the blog...see, you are so clever. 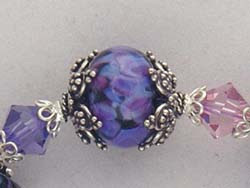 Angie at Bead Addicts was inspired by my site to start spotlighting artists each week and chose me as the first one...how cool is that! Click here and then scroll down to read the highlights. Okay, everyone, Here I go. I just need to create email groups and then I'll be publicly announcing the grand opening of my new jewelry website www.RockerJewlz.com! Yaaahoooooo! You'll have fun visiting RockerJewlz often as I enjoy making photo and text changes regularly. See you there!